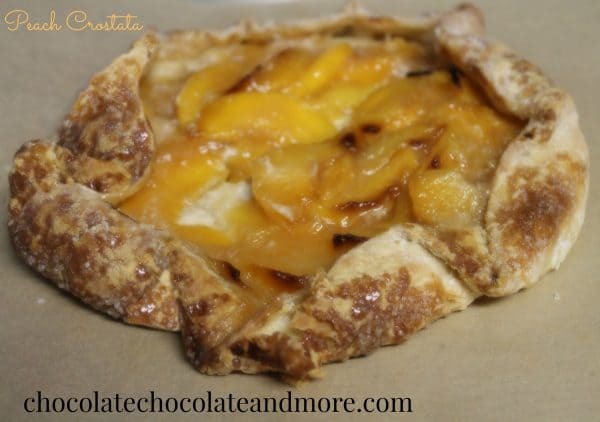 Peach Crostata - Chocolate Chocolate and More! Peaches are in season – they fill tables at my local Farmer’s Market, and there are multiple kinds to select from in the grocery store. I love peaches, and am always looking for new ways to use them beyond peach pie, peach ice cream, or peaches AND ice cream. On a recent visit to my local grocery store they had a Peach Crostata for sale in the bakery — it was covered with almond slivers and cost about as much as a whole cake. I decided I could make this at home, enjoy it fresh out of the oven, and dispose of the almond topping. A crostata is defined as a rustic free form version of a fruit tart. Some are made in pie pans, and others are made like I made mine — by folding the dough around the fruit to hold the filling in. The recipe takes about 2 hours or so to make, with two visits to the refrigerator before baking if you are making the dough from scratch. An alternative is buying pre-made pie crust — which won’t quite turn out exactly the same, but will save you over an hour in total prep and baking time. As you bake it, be careful to not overcook — the crust has a layer of turbinado sugar that can burn, and you don’t want to let your peaches get too well baked — just lightly browned. 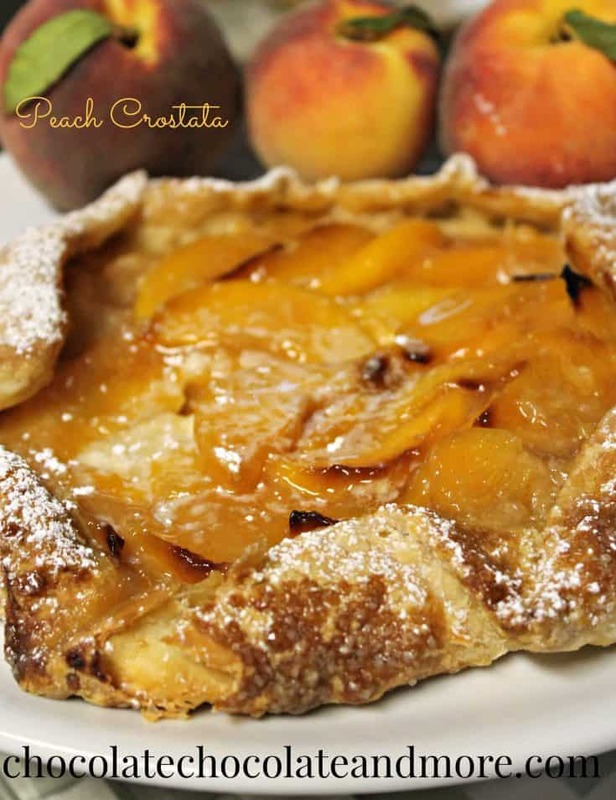 Once you remove the finished peach crostata from the oven, let it cool for about 15 minutes. 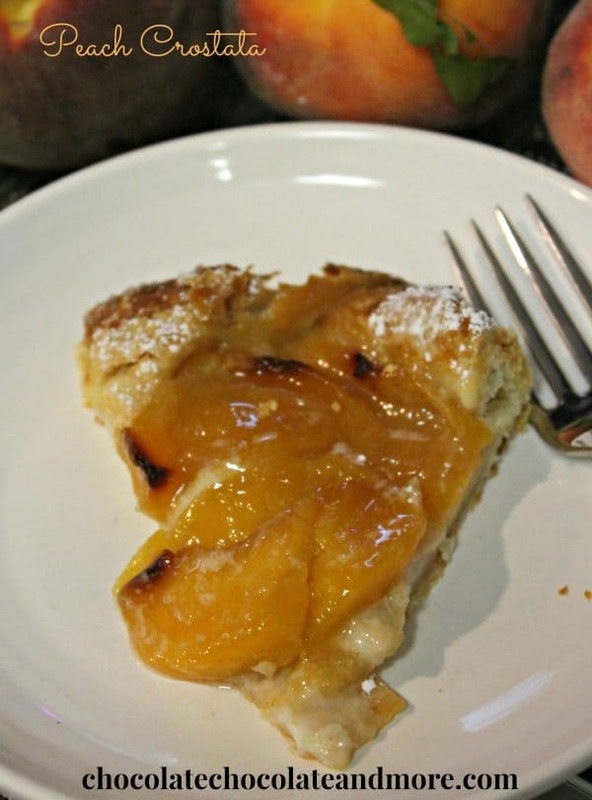 Sprinkle some powdered sugar across the top and on the crust to add a little additional sweetness to the slight tartness of the peaches. A great final touch would be a nice scoop of vanilla ice cream, or some fresh whipped cream on the side — or you can just dive into it as is! No matter how you eat it, I’m sure you’ll enjoy every bite! Using a stand mixer (or food processor if you have one) combine the 1 1/2 cups of flour with the granulated sugar and 1/2 teaspoon of salt. Add the butter and mix until the dough pebbles up into pearl-sized pieces. Add the water and mix until the dough is moistened. Transfer the dough to a lightly floured surface and pat it into a circle. Wrap the dough with plastic wrap and refrigerate until chilled, approximately 30 minutes. In a large bowl, toss the peaches with the brown sugar, vanilla, cinnamon, a pinch of salt and the remaining 2 tablespoons of flour. Remove the dough from the refrigerator and roll out on a lightly floured surface until 12-inches round. Transfer the dough to a parchment-lined, rimmed baking sheet. Add peach mixture in the middle of the dough, leaving a 2-inch border all around. Fold the edge of the dough up and over the peaches. Refrigerate the tart until chilled, about 30 minutes. Remove the chilled tart from the refrigerator and brush the dough with the cream and sprinkle with the turbinado sugar. Bake for about 50 minutes, until the crust is golden and the peaches are bubbling. Sprinkle powdered sugar over top and crust of crostata. Serve with whipped cream, ice cream, or all by itself! Wow.. that looks so amazing and delicious. I love crostatas together with ice cream.